From Monday 9 November, students who have detentions will be expected to make their own way to the detention venue at the end of the school day; they will no longer be collected by staff. Any students who fail to attend or successfully complete a detention will be internally excluded the following day or the next day they attend school if absent. Ofsted has recently completed a monitoring inspection of Ipswich Academy. The report is available from the Ofsted web site. 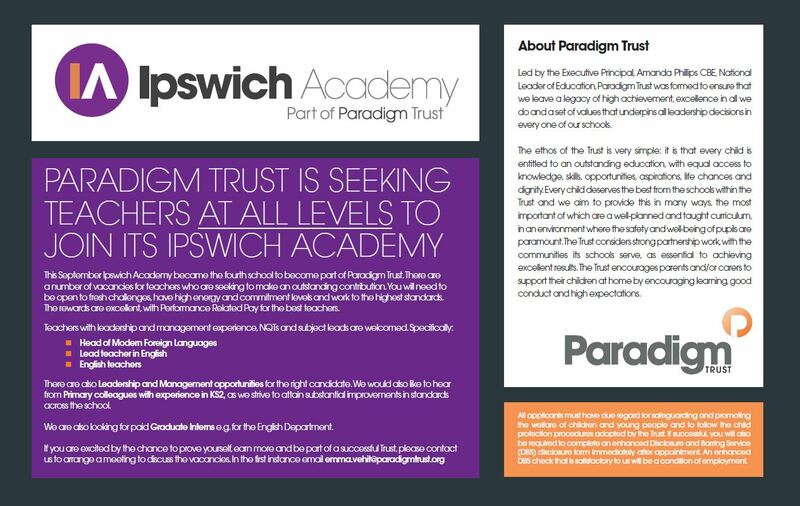 Paradigm Trust/Ipswich Academy are pleased to announce that we will be exhibiting at the Train to Teach Roadshow event on Tuesday 10 November 2015 at Trinity Park, Ipswich. The event will be open to the public between 5 and 8pm. 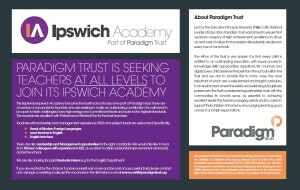 Information will be available as to the primary and secondary opportunities available within Paradigm Trust, both in Ipswich and in London. Information concerning our subject knowledge enhancement (SKE) offer will also be available. 14 students represented the academy in the annual Schools Cross Country Championships held at The Royal Hospital School, Holbrook. Selection to represent the school took place during PE lessons, where all pupils were timed over a 2.5km course as part of their fitness training module. At the actual event, effort levels from all the students were fantastic, with some students representing the academy for the first time. Top honours go to year 7 students Archie Exworth and Luke Warren, who qualified for the County Championships. Well done to Archie and Luke in particular, and to everyone who took part. Thank you to staff for organising and encouraging. We have a number of vacancies for teachers who are seeking to make an outstanding contribution. You will need to be open to fresh challenges, have high energy and commitment levels and work to the highest standards. The rewards are excellent, with performance-related pay for the best teachers. There are also Leadership and Management opportunities for the right candidate. We would also like to hear from primary colleagues with experience in KS2, as we strive to attain substantial improvements in standards across the school. We are also looking for paid graduate interns e.g. for the English Department.